Last month I had the privilege of attending a Turkey Masterclass with the one and only Cyrus Todiwala at his restaurant Cafe Spice Namaste in London. If you have been watching The Incredible Spice Men, you will already know that Cyrus is not only an incredible cook, but he's also a wealth of food (and non-food) related knowledge. He's also an incredibly funny guy. Believe it or not, turkey is used a great deal in Indian cooking as it's so versatile. Also, contrary to popular belief, it's very juicy. Why does it have a reputation for being dry? Because it's usually overcooked. Poor old bird doesn't get much of a look in between each Christmas in our country, we're the lowest consumers of turkey in Europe. Here's a little bit of information about British turkey farming. A turkey takes around 22 weeks to mature and chickens take just 6-8 weeks, which makes it tougher for British Turkey farmers to make a living. However, all the turkey you can buy in our country is British, so by buying turkey, you're automatically supporting British farmers. Hooray! Cyrus used two of my most favourite ingredients - turkey and spices - to create an array of dishes before our very eyes for us to enjoy. When I say turkey, I mean turkey - he used some unusual parts of the bird! The first plate was pan fried spiced turkey liver. Some people have a thing about liver, but I like it and the turkey liver was great. You can buy it fresh in Waitrose and frozen in Tesco. Cyrus whipped up an omelette with turkey eggs and spices including fresh green chillies and ginger. It was so delicious, I especially loved the kick of the green chilli. He then passed round some slow cooked turkey neck and told us a story of how he and his siblings would fight over the neck as kids! I can sort of see why, it was incredibly tender and full of flavour. Starters (yes, we're just onto starters now) was a trio of delicious looking Indian treats. Cyrus told us to eat them before he told us what was in them. 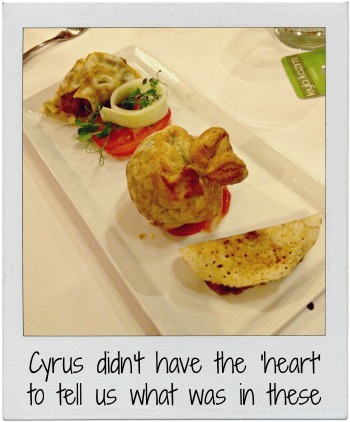 Turns out that the Mini Turkey Masala Pie was made with turkey heart! I would never have guessed that's what I was eating and I was just relieved it was nothing worse. Then we were onto main course, or should I say main courses as there were several delicious turkey curry dishes to try. My favourite was the Trio of Turkey Tikkas, each with a different marinade which gave them a different colour and varied heat. It was served with Vagharaela Chaawal, rice with cumin and caramelised onion, and Potato Dosa Bhajee, which was mashed potato with lentils, mustard seeds and curry seeds. I was as stuffed as, well, a turkey, but I managed to find space for dessert, which was a saffron, ginger and cardamom crème brulee made with turkey eggs accompanied by a fresh fruit salad. The crème brulee was incredible. Such a nice twist on a classic, the cardamom really made it. I need to somehow recreate this at home. Cyrus Todiwala is a lovely, lovely guy and now one of my favourite chefs. Big thank you to British Turkey for putting on such a fabulous evening. Please check out all their turkey recipes as turkey is far too good to just be saved for Christmas.